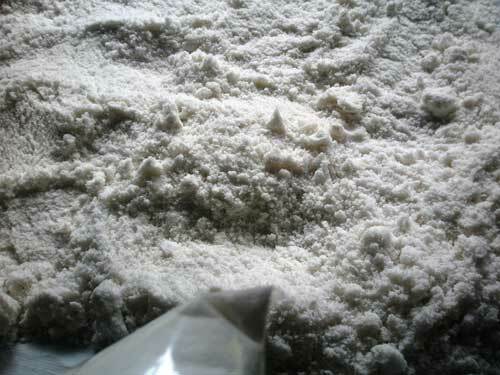 The white-powder salt produced at Buduk Bui. FROM the main road, a plume of white smoke could be seen ascending from the roof of a small house at the far end of a pasture. For first timers, they must be wondering what’s going on? The answer to the curiosity is quite simple — people are making salt inside the smoke house. Everyone knows salt is present in vast quantities in the sea but here in Ba Kelalan, the mineral is being produced at the foot of a hill. Usually, salt is produced from salt mines or by evaporating seawater or mineral-rich spring water in shallow pools. Major industrial salt products are caustic soda and chlorine. Salt is also used in many industrial processes and for human consumption. Edible salt is sold as sea salt and table salt which usually contains an anti-caking agent and may be iodised to prevent iodine deficiency. It is also used for cooking and is present in many processed foods. Salt production is not new in Sarawak. Some of the earliest evidence of local salt processing dates back more than a century when people Ba Kelalan boiled spring water to extract salt. Awang Tengah performing the earth-breaking for the new salt making facilities at Buduk Bui. Also seen are (from right) Len, Naroden and Lawas MP Datuk Henry Sum Agung. The Ba Kelalan salt springs were discovered generations ago by hunters who noticed animals liked to drink the water there. It is said hunters in the old days found meat of animals which fell into the salty pool taste better. The people began using the “tasty” spring water for cooking before learning how to make salt from it. They used the salt for themselves and sold it to the other villagers and in the town. They still do. Garam Bukit (hill salt), known as tuchu in Lun Bawang can be found in two sources – Salt Licks and Salt Spring. Salt licks or Jenut, Sira, Taram, Sesapan (Malay), Apan (Iban), Rupan (Kelabit) consist of mineral deposit such as magnesium, calcium, phosphorusand zinc (Van Strien, 1985). They are consumed by animals for their nutritional values. Lakai and his wife standing behind their white-powder salt. Salt spring or mata air garam is salt water flowing from the Earth’s crust into the lower valley. It comprises more than 70 types of minerals, including calcium, magnesium and zinc. The source of salt springs in Ba Kelalan can be found at three areas — Buduk Bui, Pa Komap and Punang Kelalan — usually at the foothills and near the riverbank. The salt springs and processing facilities are open for use to all the villagers. For decades, the community in Ba Kelalan had been using a conventional method to derive salt water from salt springs to make salt crystals. 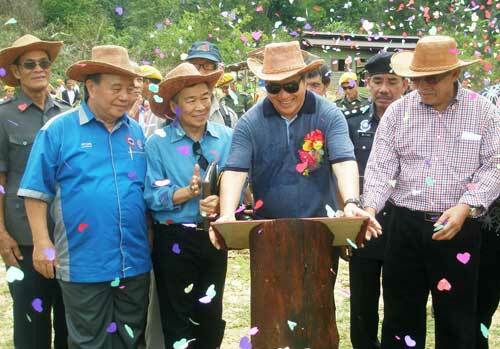 However, after identifying the weaknesses of the salt-making process, the Sarawak Forest Department, through its Community Service Initiative Unit (CSIU), decided to help the community at Buduk Bui upgrade the facilities for efficient salt water collection. This is one of the Department’s activities under its Community Development Programme at Pulong Tau National Park. It is funded by the Resource Planning and Environment Ministry under 10th Malaysian Plan (2012-15). Buduk Bui or Bukit Angin in Bahasa Malaysia consists of three villages – Telal Buda, Long Nawi and Long Rangat. Located within the Maligan Highlands, it is inhabited by the Lun Bawang community. Altogether, there are 35 families living in the three villages. The community comprise mainly farmers and tourist guides. Salt making is for side income and usually carried out after padi planting. Life is expected to be better for the people at Buduk Bui on completion of the processing facilities. The installation of the piping and storage system is expected to help increase production in a more efficient manner. 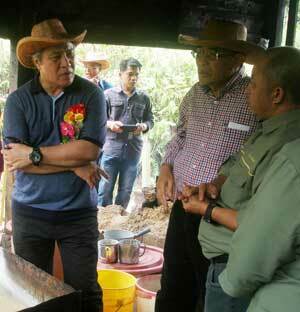 Better salt-making facilities at Buduk Bui may also enhance eco-tourism within the area. 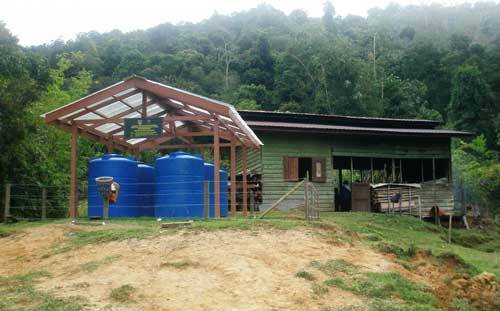 To date, the facilities provided by the Sarawak Forest Department consist of six water tanks (800 litre each) and a poly pipe for channelling salt water from the three wells to the tanks for storage. Awang Tengah and Len at a Sarawak Forest Department briefing. The construction of these facilities was completed under the Department’s Innovative and Creative Group (Kumpulan Inovatif dan Kreatif) project. Future upgrading works will include the construction of four building blocks equipped with bedrooms, kitchens, living and packaging rooms, salt processing furnace and two burning stoves, one toilet and bathroom and one firewood storage hut. A 250-300m long plank walkway from the main road to the salt-making site will also be built. Second Resource Planning and Environment Minister Datuk Awang Tengah Ali Hasan performed the earth-breaking for the project at Buduk Bui recently. Also present were Environment Assistant Minister Datuk Len Talif Salleh and Assistant Minister in the Chief Minister’s Department Datuk Naroden Majais. Even with all the facilities in place, making salt from the spring water is not easy. First, the salt-makers have to cut their own fire wood. And finding the wood is not easy with the material becoming scarce over time. The salt-makers cannot collect wood from other plots of land without the owner’s consent. To make salt, iron drums are placed over wood encased in clay and kept burning constantly. Evaporating the water may take a few days, depending on the fire that dries the spring water into several kilogrammes of white salt. “It takes me to three to four days to boil and dry the spring water before I can have the salt,” salt-maker Lakai Sultan revealed. There are now six sliced iron drums at the processing facilities at Buduk Bui. Four are for liquid salt while the other two for drying semi-solid salt. It’s said salt-makers in the early days used to pitch tents near the fires for days and nights. But over the years, permanent shelters have been provided at the salt spring in Buduk Bui. Now, they can rest and sleep under permanent roofs while waiting for the fire to dry the spring water to produce salt. It may not easy for the others to make salt at Buduk Bui but not so for Lakai as the facility is built within Lakai Sultan’s land — which means collecting wood is not a problem. “This is my own land, so getting wood is not a problem. For the others, they have to collect their wood elsewhere and carry it to the smoke house,” Lakai Sultan said. The house is about 500 metres from the main road. 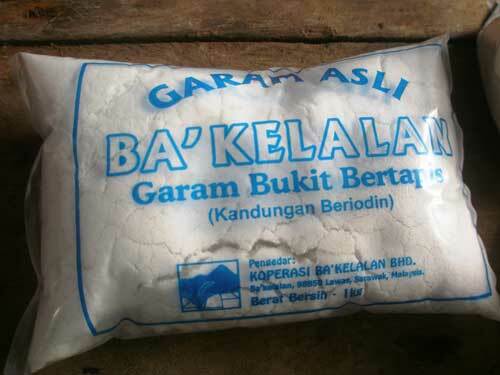 The hill salt of Buduk Bui packed in plastic bags. For now, getting the iron drums is another problem faced by the salt-makers. The drums may not last as salt corrodes the steel fast. The drums are not cheap. It takes several hours to drive from Ba Kelalan to the nearest town to obtain them. 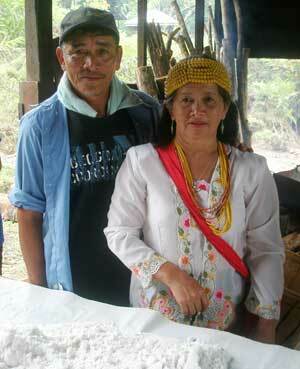 The Lun Bawangs believe their natural hill salt has its own nutritious value. To them, it’s a healthy type of salt rich in iodine and when consumed, will strengthen the knee joints and cure tyroid. At Buduk Bui, the villagers have worked together to dig wells — not near a river but at the foothills dotting the mountains of North Sarawak, the only place in Borneo where salt water bubbles up from the ground. Like in any salt springs in the area, the one at Buduk Bui can be used by any villagers willing to chop and cart firewood to the smoke house. In fact, Ba Kelalan is already famed for its highland salt made the old way. The white-powdered salt is either wrapped with leaves or pack in plastics to make it last longer. It is believed the natural salt has been there over a hundred years and was an important barter trade item in the past. The salt is now sought after by people from the Chinese community, especially from Brunei and Sabah, who use it for medicinal purposes. It has also become an important article of trade among the Lun Bawang in Ba Kelalan, where the commodity is on sale the airport, and some retail shops in Miri. Selling at RM18 per kg, the salt is less salty than sea salt. The current salt processing facility at Buduk Bui.